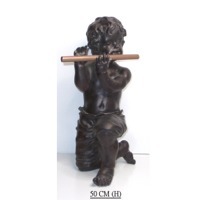 Browse stone-sculpture-fountains-garden-decorations suppliers by country and region. DESCRIPTION Size - 3(h) x 3(w) x1.9(d) in Weight - 800 gm This 20th century ruin stone statue is the depict of the prince Siddhartha, who later known as Buddha and the founder of Buddhism. Standing 3 inches high, 3 inches width this monumental Buddha head is a superb testament to the earliest Buddhism phase. This sculpture indicates true spirituality that gives the importance of Buddhist ideology. DESCRIPTION Size - 48 X 30 X 25 IN This marble sculpture displays the finnest example of latest marble sculpture selections for sale all around the world. This sculpture gives you the joy of piece through its creative approach in aestheitic designing sense. Short on time? Let stone-sculpture-fountains-garden-decorations sellers contact you. Sagarmatha Art Gallery Pvt. Ltd.
Indian handicraft, stone artwares, crochet lace table, bed covers, sheets, handmade paper items, incense sticks, jewellery items. Artificial jewellery, bracelets, necklaces, art, masks, african print headwraps and scarfs, baby products, home and outdoor, toys, children educational books. Floating Water Fountains are installed on the floating platform, which could rise or drop with the water level changes, so the fountain working would not be affected by seasonal water level difference. Floating fountain could be both Musical Fountain and Program Controlling Fountain. The floating platform are made by steel or stainless steel plates with anti-corrosion painting, which insures its servicing life. It is widely used in large nature or artificial lake or river. The various water features dance with the rhythm of music. When the music goes high, the water jettings will go higher. When the music goes down, the water jettings follow the rhythm as well. The lights also follow the rhythm to switch on and off. The different colors keep shining alternately, make it like a party holding on the river. Water Screen Generator Water Screen Generator creates huge fan-shaped water-screen, which goes to 40-80meters long. In combination with laser generator and projector, people can get magnificent colored photos, words or movies. Water Screen Movie Water Screen Movie System consists of water screen generator and projector. The water screen is usually 20-meter high and 30-50 meters long. Various kinds of video-disks can be displayed on water screen. At night time, the screen will melt into the darkness, and the characters in movie look as if they fly from the sky or group up from under the water onto water-screen, which is very attractive, interesting and mysterious. Himalaya Music Fountain, with bunches of certificates and honors in variety, is one of the largest water-fountain equipment factories in China, we have installed water fountain projects in more than 30 countries around the world. Music fountain is kind of construction, every single project is different from each other. It usually takes 4 steps to for building one music fountain: 1.Buyer offers the size and Shape of the water area; 2.Himalaya Music Fountain makes the design, including Auto CAD drawings, Perspective Photos and quotation list; 3.Confirmation of Designing, Contracting, Production and shipment; 4.Installation. Fire Fountain, normally has got two kinds of fuels. LPG and Alcohol-based fuel. And by the usage, it can has 3 types, fire on water, fire-ball, and fire torch with water pillar. People will get excited and surprised when fire comes out with music's high pitch, as people fears fire from instinct, it is kind unexpected surprise to them. Jet fountain, is developed from Glazy Water Column Fountain which can cut the arc segment by segment. By a short actuation, the glazy water segment could fly through the air. If there are more than 3 Jumping Nozzles operating together, their water sprays could chase each other, which is full with fun. The Jumping Jet Water Features are applicable in the shopping mall, garden, amusing park, etc. They could also be integrated with the Musical Dancing Fountain or Program Control Fountain. We have the expertise and tools to help you realise your Landscaping ideas for Garden & Landscaping products. This mainly include stone, marble, wood, soil, cement and many more materials related to the same. Our clients can avail from us high quality range of Garden Planters, Pots & Urns, Grover pots. Material : Metal, SS, Marble, Ceramic, Sandstone, Wire Hanging Decorative Pots. Suitable for decorating garden, balcony and staircase. We provide a wide range full of various colors and sizes, as per requirements placed by our valued clients. Manufacturers of pvc garden pipe. Manufacturers of flyash bricks.